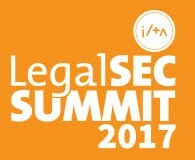 If you were unable to attend the 2017 LegalSEC Summit in DC this past week, or attended and had to choose between the great sessions being offered, we've now uploaded the recordings and presentation materials to the LegalSEC Resource Library under the 2017 LegalSEC Summit folder. Also included are the materials from the pre-summit workshops. Please note that due to the nature of the content - the access to the materials and recordings will be restricted to members only so members must be logged in when clicking on the links below. Closing the Barn Door: Is It Too Late To Mitigate the Risk of Mobile Lawyers? What's New in Penetration Testing? Payment Card Industry (PCI) Compliance: Does It Affect Me? Windows Server 2016: What's New with Security? iManage Solution Spotlight: A perimeter breach is inevitable, what is your next line of defense?